This is my blog dedicated to my Lord who bought me at a high price; His own blood, therefore, I am a slave of Jesus Christ. My former master is cruel for the wages of sin is death, but Jesus my Lord and Savior is kind, He redeemed me from the penalty of sin; and He is redeeming me from the power of sin; and He will redeem me from the presence of sin. Therefore, all that I do belongs to Christ. In the summer of 1992 I got out of the Army after nearly 5 years of service; I was lost and did not know what to do, I had a wife and child with no job. At that time, I did not know the Lord and was not following Him, but I can now see the hand of God in everything. I had signed up for the Army college fund when I joined the Army so I decided to go to school that fall since I would receive a monthly check while attending college. I attended the local community college that was near my boyhood home. Richland College in Dallas, Texas. After two years of college I received an Associates of Arts & Sciences in May of 1994. A general studies degree received at a junior college prior to beginning junior and senior level classes at a university. My wife was a surgical technologist so I knew several nurses and thought that it would be a good profession. I applied to the University of Texas at Arlington in an attempt to get a Bachelor of Science in Nursing, I was not accepted. I was now back where I was when I got out of the Army feeling hopeless and lost. I now had two years of college, but still no real wage-earning job. That summer I retook a class that I had gotten a C in to raise my GPA. I got a job at Medical City in Dallas and spent the next year as a transporter pushing patients who needed x-rays around the hospital on stretchers and wheelchairs. During that year I applied again for admittance to the University of Texas at Arlington and also the nursing program with the Dallas County Community Colleges. Once again, I was not accepted into the University, but I was accepted into the community college nursing program. I graduated with an Associate Degree in Nursing in December of 1997, passed the nursing board exam and began working as a Registered Nurse. I quickly gravitated towards Critical Care (ICU) Nursing and then Cardiovascular Intensive Care Nursing. Once I came to know the Lord and follow Him, April 2003, my outlook on nursing began to change from income oriented to servant oriented. My personal philosophy of nursing proceeds forth from my faith in Christ Jesus. God is love and Jesus is the image of the invisible God making Him the personification of love. He said to love one another even as I have loved you; God demonstrates His own love toward us in that while we were yet sinners Christ died for us. Nurses are helpers of those in need! It had always bothered me that I was not able to obtain a Bachelor Degree, but it was difficult to justify going back to school when it would change nothing with my job, I would remain a Registered Nurse with or without a Bachelor Degree. This came to a head in June of 2014. I enjoy teaching, but was not being allowed to teach because of my associate degree and lack of nursing certifications. Therefore, I applied for the RN to Bachelor of Science in Nursing program at the University that I had been turned away from 21 years prior. To the glory of God, I graduated on December 17th from the University of Texas at Arlington with a Bachelor of Science in Nursing. While sitting and taking part in the graduation ceremony I looked at the decorated caps on many of the young graduates who were just entering the profession of nursing. Several of them had decorated their cap and some of them had the words written “NEVER GIVE UP”. Wow! 21 years ago, I was turned away from the University that I am now graduating from. NEVER GIVE UP! While attending school, I had planned to attend seminary since I would now be eligible for graduate school and had a desire to follow my Lord Jesus Christ and serve Him. But while taking part in the graduation ceremony, I saw something that changed me. 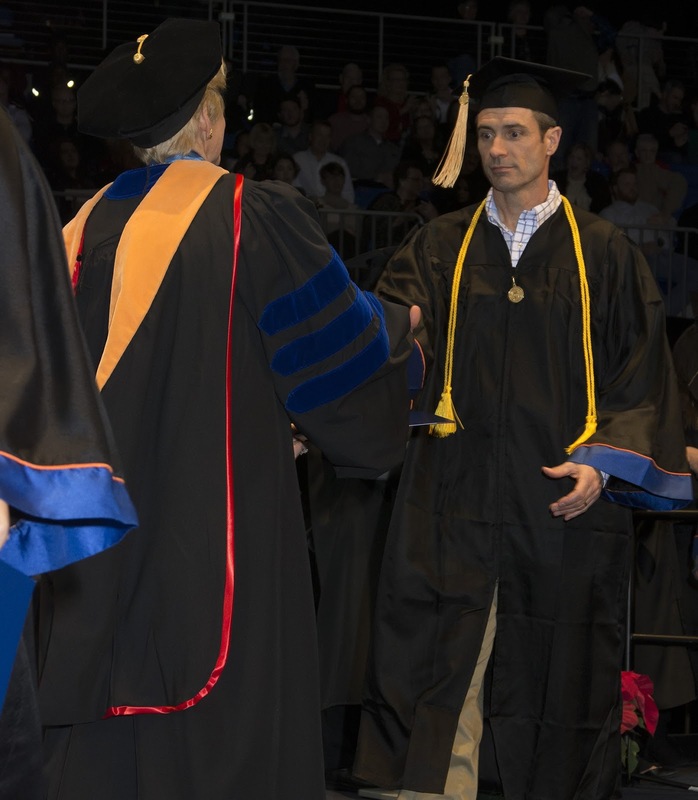 The graduate students were the first to walk across the stage. There were several receiving a Master of Nursing Administration, there were a great number receiving a Master of Nursing Practice, but a very small number receiving a Master of Nursing Education. With the great majority of graduate students going into advance practice or administration who is going to teach people to be nurses? The Lord had put me in nursing and my nursing philosophy was given to me by Him. The Lord’s great commission is to make disciples and teach them to obey all that He commanded. I realized that it would be keeping with His great commission to teach young upcoming nurses to love and help people in need. Therefore, my desire is to honor God, exalt Jesus Christ, and seek the best for my neighbor. I believe that this can be accomplished by teaching people about the Lord Jesus Christ and teaching people how to best serve others in nursing. Josephine Dolan a nurse historian wrote as quoted “Even after nineteen hundred years it is difficult to fully comprehend the impact of the birth of Jesus Christ and His teaching on society and the care of the sick” (Hutchison, 1998).